The main characters of the work “Friends” are a boy and a dog. The boy is dressed in home clothes and gently strokes his pet. It is evident that the four-legged friend is devoted to his master, she looks at him, understands, but cannot say anything. 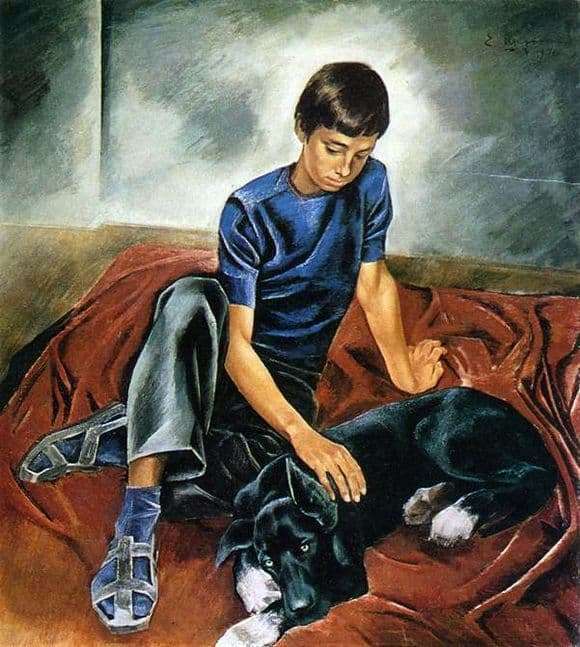 The dog’s constricted ear speaks of its concentration, it seems to understand the boy and sympathize with him. In the look of the animal, sadness can be seen, it is clear that the dog feels that he wants to tell the boy. Mood is transmitted to the animal. Perhaps the boy’s problem is small, deuce at school, but for him at this age everything is perceived badly. It is evident that they are true friends. One feels that the boy is sad and is looking for understanding from his pet. The sadness of the dog is due to the inability to help the boy, he can only support and listen to him. The boy sits in the shoes, probably He was immersed in his thoughts and wanted to quickly share his mood with his four-legged friend. The picture is invisible bright light or incident sunlight. Light moment also shows the sad mood of the characters. The whole picture is written in dark tones and conveys the general mood of sadness. The red sofa symbolizes anxiety. The background of the wall is dull and inconspicuous. The whole atmosphere creates a tense atmosphere. The artist is very realistic conveyed the essence of this friendship. After all, friends not only share the joy, but also sadness. A true friendship can only be experienced with adversity. Apparently for a boy the dog is the closest friend and listener. The animal, in turn, sits quietly and dutifully. Probably, such communication between two friends is not uncommon. Often at this age, children are asked to have a dog. For them, it may be possible to find the only faithful friend who is so lacking in real life. After all, a true friend is checked for years.